Kids Station, a complete kids need’s store in Jubilee Hills has everything from toys to clothes and baby care products. Don’t be fooled by how small it looks, but walk in to find a paradise for juniors. 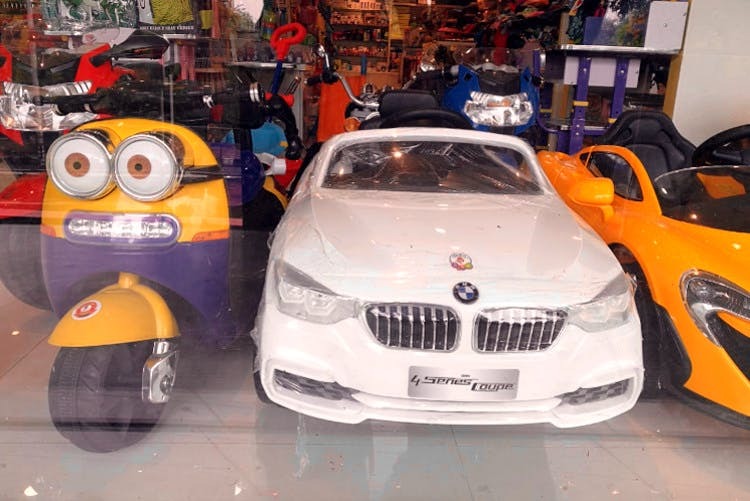 Grabbing your little one’s fancy at first glance, this store is full of all things awesome. Hold your kiddo close and tight lest they try to grab everything on the shelves here. Enter toy cars, Barbie dolls, Lego sets, Hot Wheels, train sets, Nerf guns, and dollhouses (You’ll want to be a kid again, trust us!). Cute suitcases and backpacks with prints of your kiddie’s favourite characters from Minions to Snow White are available here. So, next time the little one creates a fuss about packing, lure them into making your vacations a success with these quirky luggage bags. They have an entire section for clothes that range from simple t-shirts to vibrant prints and doodles. Some with quirky text and night dresses too. Does kiddie want to party? Don’t you worry, for this store has party wear from truffled fairy dresses to tuxedos for your li’l man. You will also find hair bands and caps if your kiddo's fashion game is casual. All the products here will cater to an age group from a new born baby to a 10-year-old. Make bath time fun for the babies by buying bath care products not limited to Johnsons’ Baby creams and powders, but more like teethers, pacifiers, baby nail cutters, medicine droppers, baby bathtubs. Got a playful kid? Toddler cycles and walkers will make them happy. For infants, you can grab a stroller, pram and baby carrier from their limited collection, or even get a perfect cradle. Most of their products are imported from different parts of the world, and the shop keepers swear by their quality and assure us that they are safe.